Type ER70S-6 is a wire with higher levels of Deoxidizers welding of steels with moderate amounts of scale or rust. (Mn & Si) compared to other carbon steel wires. 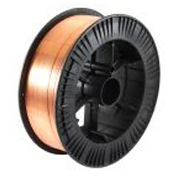 This wire is suitable for welding of steels with moderate amounts of scale or rust. For Mig welding use Carbon Dioxide or Argon + Co2 or Argon + 2% Oxygen as shielding gases.